ABSOLUTELY THE BIGGEST FINANCIAL SCAM AIMED AT YOUTH IN THE WORLD. ORGANIZED PREDATORY FINANCIAL COLLUSION. WHAT CAN “WE THE PEOPLE” DO AS AN IMMEDIATE SOLUTION? When the government colludes with the financial banksters and the University and educational system this deeply, they rig the system almost air-tight. They’ve covered every flank and angle. They’ve taken away any leverage or recourse from you. Even just a few minutes into the film you see just how they cage you in by leveraging the legislative system, the credit reporting system and the Internal Revenue Service’s collection system to leave you no breathing room. Absolutely enslaved and imprisoned in their economic cell, for the rest of your life. MASSIVE ORGANIZED DEFAULT and MASSIVE POLITICAL PROTEST FOR IMMEDIATE REFORM. The only way to create leverage for reform is if people were to collectively stand up and REFUSE TO PAY and make a HUGE NOISE politically and in the media and stand together. The banks and government are just a tiny group of greedy predators. The people are a huge and powerful force (if only they’d realize it and work together). Only a massive and organized revolt of this predatory and immoral collusion would bring about popular pressure on politicians to deal with the banks and get rid of their monopoly and crime. This is far worse a crime or collusion than the Mafia ever was. 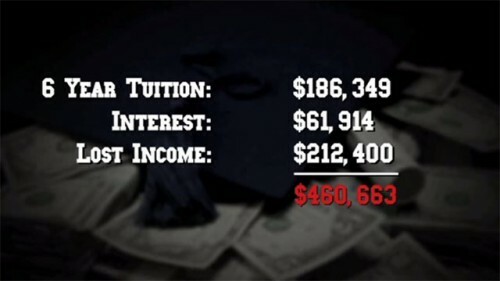 This is organized crime by the financial industry, the government and the entire educational system. 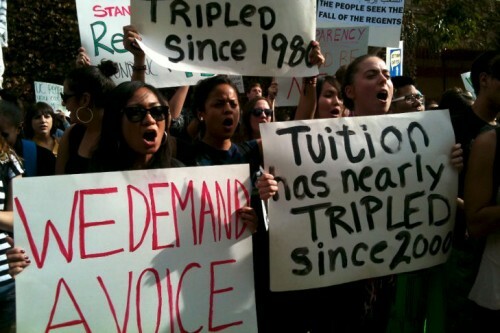 The people should absolutely default collectively and rise with a massive and loud movement to demand, not ask, that the financial system and the government immediately forgive these predatory loans and reform the entire system these immoral lending institutions have created to cause a synthetic hyper inflation in the prices of all educational costs including tuition, books and everything else. IF THEY HAD TRILLIONS TO BAIL OUT THE AUTO INDUSTRY AND THE BANKS DURING THE HOUSING BUBBLE COLLAPSE, THEY HAVE BILLIONS TO BAIL OUT THEIR OWN PEOPLE – IF THE PEOPLE DEMAND IT. Just like it happened with the automobile and housing industry, when financing becomes this predatory, it absolutely allows prices to be increased synthetically and in perpetuity (forever) because, “you’re only going to be paying a small monthly payment anyway,” so prices get jacked up way higher than if everyone was only paying as they went and in cash. If the people rose up collectively, the political pressure would be brought to bear and it would create a more even playing field to negotiate a reform of this one sided system. This entire massive scam was designed and created by ONE SIDE having all the leverage and taking it to the extreme. The people were never at the table. They need to get to the table now, immediately and demand change and a bailout for themselves. If the people refuse to collectively rise, organize and demand change by mass political and financial default and protest, then NOTHING will change. All the leverage is being used against the common people. The financial system, the government and the educational system has ALL OF THE LEVERAGE and the victim of this financial crime (the students) have absolutely zero voice or influence in the matter. There simply is no other way around it. If you have no leverage and no option but to raise cash and pay your student loan debt off, then you absolutely must create ways to generate way more cash than you are now. Again, the power is with the people in this solution as well. The “normal” economic system we work with here is NOT GOOD ENOUGH and not designed to render the amount of income you need in the time you need it to actually pay for your life and pay off all your debt. It was designed and it is maintained to NOT pay you enough and keep you indentured for your whole life. 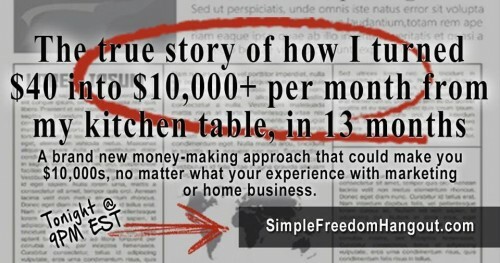 You MUST use “off-the-grid” methods of creating more cash in a faster amount of time. …you need to focus on simpler ways to collectively use the power of the people to create substantial amounts of cash in faster amounts of time. With the Internet and Social Networks you can do it. With the traditional economy (jobs, careers, professions and traditional small business) you can’t. Many people are discovering revolutionary new cash creation methods that give people the power and not the banks, huge corporations and the government. Click here to learn more about them and how I can help you.